Two minutes. Two iPads. $18,000 in scholarships! Toronto – March 24, 2018 – Scholarships are crucial for covering the increasing cost of tuition and reducing the amount that you and your family have to pay out of pocket for post-secondary education. That is one reason why UFCW Canada offers 18 UFCW Canada – BDM Scholarships worth $1,000 each to active members and their family members for post-secondary study. Applying for the UFCW Canada – BDM Scholarship program is easy: no essay is required (that’s right – NO ESSAY), and it only takes two minutes to apply online. In addition, as part of the UFCW BDM Scholarship Contest, you can win an iPad by referring students to apply for this renowned union scholarship. Every member who refers eligible students to apply for a UFCW Canada - BDM Scholarship receives a chance to win one of two brand new Apple iPads! One iPad is randomly drawn, while the other is awarded to the entrant who refers the most eligible students. Last year, over 548 members were referred to the UFCW Canada – BDM Scholarship program. 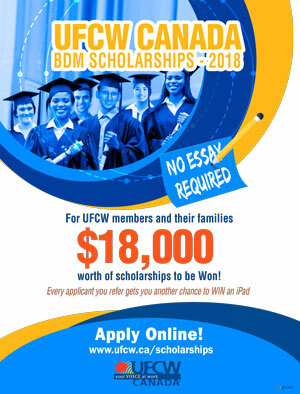 The deadline for both the UFCW Canada – BDM Scholarship application and the UFCW BDM Scholarship Contest is September 30, 2018. Don't miss this amazing opportunity to win! To apply for the UFCW Canada – BDM Scholarship, click here. To refer eligible students to apply for the scholarship, click here.